The 2018 Affinity Credit Union Senior Women’s Provincial Curling Championship consisted of an 8-team round robin format leading into a page playoff system. This year’s event saw a string of tie-breakers for the second year in a row, with three teams (Inglis, Anderson & Streifel) all with identical 4-3 records! This is where Anderson got on a roll winning both tie breaker games, followed up by a tight 5-4 win over Moose Jaws Lorraine Arguin in the semi-finals. The championship final featured two provincial champions from 2017, with Anderson winning the Senior Women’s title & Wadena’s Delores Syrota winning the Masters Women’s title. The teams traded singles throughout the mid-way portion of this game, with the turning point being Anderson scoring back-to-back deuces to clinch the 6-3 win, defending their provincial title. At the Canadian Championship, Team Saskatchewan started the week off with a 2-2 record after six draws of play in Stratford. Team Saskatchewan then went on to win six straight games to earn them a spot in the semi-finals against Team Ontario. Anderson and team played a back and forth game after the break where it was all squared up at 2-2. The turning point in this one was a big score of four by Team Saskatchewan in the 5th end, leading to their 7-4 victory. 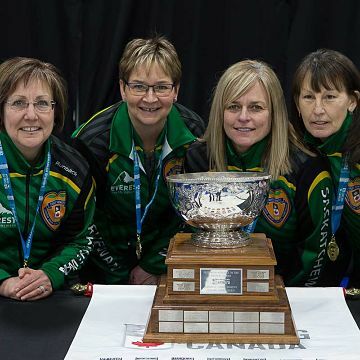 Sherry, Patty, Brenda & Anita rallied together an unbelievable comeback in the final against Team Nova Scotia. Where they found themselves down 4-0 after three ends, taking the eventual final 8-7 in an extra end! Anderson and team will represent Canada at the 2019 World Senior Curling Championships looking to defend their world title as they won the World Senior Women’s Curling Championship a few short weeks later! Congratulations on a fantastic past few seasons ladies!